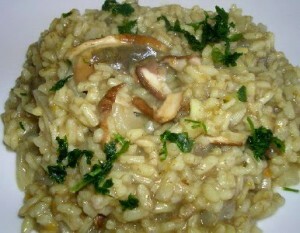 Italian Risotto with mushroom: unforgetable! The authentic Italian-style risotto is a very slow way of cooking rice! It should be slightly al dente, and it takes a lot to melt all the ingredients together but it is really worthy for your mouth to wait for such a masterpiece. In a saucepan, warm the broth you have already made over low heat. You shoud warm up 2 tablespoons of olive oil in a large saucepan over medium-high heat. Stir in the chopped mushrooms, and cook until soft (ca. 3 minutes). Remove the mushrooms and their liquid, and put aside. Add one tablespoon olive oil and stir in the shallots and after one minute add the rice, stirring with oil, ca. 2 minutes. When the rice has turned to a golden color, quickly pour in the wine. Remeber to stirring constantly until the wine is fully absorbed by the rice! Add slowly half a cup of broth to the rice; then stir until the broth is absorbed. You wll repeat this operation until the rice is al dente, ca. 15 -20 minutes max. Now you can removeyour risotto from the heat, andyou will stir in the mushrooms together with their liquid. Add the butter, the chives, and to top it all a lovely spread of Parmesan cheese. Season abit with salt and pepper, and taste it! This entry was posted on Monday, April 9th, 2012 at 5:25 pm	and is filed under Italian Recipes and Food. You can follow any responses to this entry through the RSS 2.0 feed. You can leave a response, or trackback from your own site.